Large parts of this document came from the Pandas Contributing Guide. All contributions, bug reports, bug fixes, documentation improvements, enhancements, and ideas are welcome. If you are brand new to xarray or open-source development, we recommend going through the GitHub “issues” tab to find issues that interest you. There are a number of issues listed under Documentation and good first issue where you could start out. Once you’ve found an interesting issue, you can return here to get your development environment setup. Feel free to ask questions on the mailing list. Bug reports are an important part of making xarray more stable. Having a complete bug report will allow others to reproduce the bug and provide insight into fixing. See this stackoverflow article for tips on writing a good bug report. Trying the bug-producing code out on the master branch is often a worthwhile exercise to confirm the bug still exists. It is also worth searching existing bug reports and pull requests to see if the issue has already been reported and/or fixed. Explain why the current behavior is wrong/not desired and what you expect instead. The issue will then show up to the xarray community and be open to comments/ideas from others. Now that you have an issue you want to fix, enhancement to add, or documentation to improve, you need to learn how to work with GitHub and the xarray code base. To the new user, working with Git is one of the more daunting aspects of contributing to xarray. It can very quickly become overwhelming, but sticking to the guidelines below will help keep the process straightforward and mostly trouble free. As always, if you are having difficulties please feel free to ask for help. The code is hosted on GitHub. To contribute you will need to sign up for a free GitHub account. We use Git for version control to allow many people to work together on the project. GitHub has instructions for installing git, setting up your SSH key, and configuring git. All these steps need to be completed before you can work seamlessly between your local repository and GitHub. This creates the directory xarray and connects your repository to the upstream (main project) xarray repository. To test out code changes, you’ll need to build xarray from source, which requires a Python environment. If you’re making documentation changes, you can skip to Contributing to the documentation but you won’t be able to build the documentation locally before pushing your changes. This will create the new environment, and not touch any of your existing environments, nor any existing Python installation. See the full conda docs here. This changes your working directory to the shiny-new-feature branch. Keep any changes in this branch specific to one bug or feature so it is clear what the branch brings to xarray. You can have many “shiny-new-features” and switch in between them using the git checkout command. This will replay your commits on top of the latest xarray git master. If this leads to merge conflicts, you must resolve these before submitting your pull request. If you have uncommitted changes, you will need to stash them prior to updating. This will effectively store your changes and they can be reapplied after updating. If you’re not the developer type, contributing to the documentation is still of huge value. You don’t even have to be an expert on xarray to do so! In fact, there are sections of the docs that are worse off after being written by experts. If something in the docs doesn’t make sense to you, updating the relevant section after you figure it out is a great way to ensure it will help the next person. The documentation is written in reStructuredText, which is almost like writing in plain English, and built using Sphinx. The Sphinx Documentation has an excellent introduction to reST. Review the Sphinx docs to perform more complex changes to the documentation as well. The xarray documentation consists of two parts: the docstrings in the code itself and the docs in this folder xarray/doc/. The docstrings are meant to provide a clear explanation of the usage of the individual functions, while the documentation in this folder consists of tutorial-like overviews per topic together with some other information (what’s new, installation, etc). The docstrings follow the Numpy Docstring Standard, which is used widely in the Scientific Python community. This standard specifies the format of the different sections of the docstring. See this document for a detailed explanation, or look at some of the existing functions to extend it in a similar manner. Almost all code examples in the docs are run (and the output saved) during the doc build. This approach means that code examples will always be up to date, but it does make the doc building a bit more complex. Our API documentation in doc/api.rst houses the auto-generated documentation from the docstrings. For classes, there are a few subtleties around controlling which methods and attributes have pages auto-generated. Every method should be included in a toctree in api.rst, else Sphinx will emit a warning. First, you need to have a development environment to be able to build xarray (see the docs on creating a development environment above). Then you can find the HTML output in the folder xarray/doc/build/html/. The first time you build the docs, it will take quite a while because it has to run all the code examples and build all the generated docstring pages. In subsequent evocations, sphinx will try to only build the pages that have been modified. Writing good code is not just about what you write. It is also about how you write it. During Continuous Integration testing, several tools will be run to check your code for stylistic errors. Generating any warnings will cause the test to fail. Thus, good style is a requirement for submitting code to xarray. In addition, because a lot of people use our library, it is important that we do not make sudden changes to the code that could have the potential to break a lot of user code as a result, that is, we need it to be as backwards compatible as possible to avoid mass breakages. Please try to maintain backward compatibility. xarray has growing number of users with lots of existing code, so don’t break it if at all possible. If you think breakage is, required clearly state why as part of the pull request. Also, be careful when changing method signatures and add deprecation warnings where needed. Also, add the deprecated sphinx directive to the deprecated functions or methods. The xarray test suite will run automatically on Travis-CI, and Appveyor, continuous integration services, once your pull request is submitted. However, if you wish to run the test suite on a branch prior to submitting the pull request, then the continuous integration services need to be hooked to your GitHub repository. 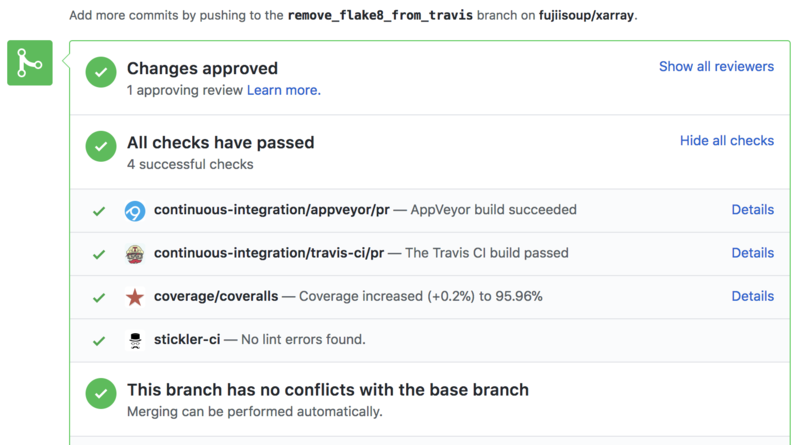 Instructions are here for Travis-CI, and Appveyor. A pull-request will be considered for merging when you have an all ‘green’ build. If any tests are failing, then you will get a red ‘X’, where you can click through to see the individual failed tests. This is an example of a green build. Each time you push to your fork, a new run of the tests will be triggered on the CI. Appveyor will auto-cancel any non-currently-running tests for that same pull-request. You can also enable the auto-cancel feature for Travis-CI here. xarray is serious about testing and strongly encourages contributors to embrace test-driven development (TDD). This development process “relies on the repetition of a very short development cycle: first the developer writes an (initially failing) automated test case that defines a desired improvement or new function, then produces the minimum amount of code to pass that test.” So, before actually writing any code, you should write your tests. Often the test can be taken from the original GitHub issue. However, it is always worth considering additional use cases and writing corresponding tests. Adding tests is one of the most common requests after code is pushed to xarray. Therefore, it is worth getting in the habit of writing tests ahead of time so this is never an issue. Like many packages, xarray uses pytest and the convenient extensions in numpy.testing. All tests should go into the tests subdirectory of the specific package. This folder contains many current examples of tests, and we suggest looking to these for inspiration. If your test requires working with files or network connectivity, there is more information on the testing page of the wiki. xarray existing test structure is mostly classed based, meaning that you will typically find tests wrapped in a class. Here is an example of a self-contained set of tests that illustrate multiple features that we like to use. pytest.mark can be used to set metadata on test functions, e.g. skip or xfail. tm.assert_series_equal (and its counter part tm.assert_frame_equal), for xarray object comparisons. We would name this file test_cool_feature.py and put in an appropriate place in the xarray/tests/ structure. Tests that we have parametrized are now accessible via the test name, for example we could run these with -k int8 to sub-select only those tests which match int8. The tests suite is exhaustive and takes a few minutes. Often it is worth running only a subset of tests first around your changes before running the entire suite. This can significantly reduce the time it takes to locally run tests before submitting a pull request. For more, see the pytest documentation. Performance matters and it is worth considering whether your code has introduced performance regressions. xarray is starting to write a suite of benchmarking tests using asv to enable easy monitoring of the performance of critical xarray operations. These benchmarks are all found in the xarray/asv_bench directory. asv supports both python2 and python3. To use all features of asv, you will need either conda or virtualenv. For more details please check the asv installation webpage. The -E virtualenv option should be added to all asv commands that run benchmarks. The default value is defined in asv.conf.json. will only run the GroupByMethods benchmark defined in groupby.py. This will display stderr from the benchmarks, and use your local python that comes from your $PATH. Information on how to write a benchmark and how to use asv can be found in the asv documentation. The xarray benchmarking suite is run remotely and the results are available here. Changes should be reflected in the release notes located in doc/whats-new.rst. This file contains an ongoing change log for each release. Add an entry to this file to document your fix, enhancement or (unavoidable) breaking change. Make sure to include the GitHub issue number when adding your entry (using `` GH1234 `` where 1234 is the issue/pull request number). If your code is an enhancement, it is most likely necessary to add usage examples to the existing documentation. This can be done following the section regarding documentation above. Keep style fixes to a separate commit to make your pull request more readable. a subject line with < 80 chars. Optionally, a commit message body. Now your code is on GitHub, but it is not yet a part of the xarray project. For that to happen, a pull request needs to be submitted on GitHub. Select the base and compare branches, if necessary. This will be master and shiny-new-feature, respectively. This will automatically update your pull request with the latest code and restart the Continuous Integration tests. Make sure you use a lower-case -d, or else git won’t warn you if your feature branch has not actually been merged.